Following the tragic accident last fall that killed Mallori Kastner and left Jeremy Mohr paralyzed, the students, faculty and staff of Grace College in Winona Lake, Indiana, have rallied around these families supporting them in different ways. This Friday the college is inviting the entire community to come together for a fundraising event that will benefit Jeremy Mohr and his family, and break a Guinness World Record at the same time. As a fundraiser for Grace College senior Jeremy Mohr, who was paralyzed after an accident last fall, five Grace College students have undertaken a record-breaking task: organize and host the world’s largest game of Knockout. According to organizers, Knockout is a game using a basketball hoop and two basketballs. It’s an individual game, not a team game. The players line up, the first and second person in line have basketballs, and the objective of the game is to make a shot before the player ahead of you in line makes his or her shot, in which case you have “knocked out” that player. After you successfully make a shot the next person in line gets your basketball and you go to the back of the line. As the game progresses more and more players get “knocked out” until there is ultimately a winner. 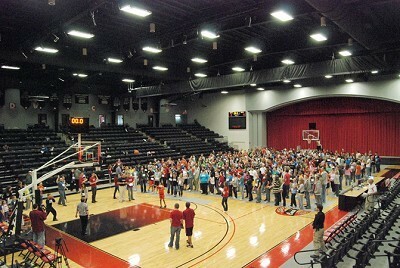 The students aim to bring more than 360 student, faculty, alumni, and community participants to the Orthopaedic Capital Center on the Grace campus this Friday, April 8, in an attempt to break the current Guinness World Record. The event, which will be held at 8 p.m., will cost $1 for admission and participation. Sophomore Zane Gard, who has taken on Mohr’s role as Grace’s student intramural director and serves as chairperson for this event, says 100 percent of the money raised through the game will go to Jeremy Mohr to help cover medical costs and personal care. Gard says he and his co-event coordinators are able to donate all of the proceeds to Mohr’s care because almost all of the event costs are covered through donations. Grace welcomes the local community to participate in a successful record-breaking by coming to the OCC at 8 p.m. on April 8 to play, watch, donate, or volunteer. Signups are not necessary to play, but those who are interested in volunteering or have questions about the event should email Gard at gardza@grace.edu. For those who do not wish to participate but would like to help, Gard says they will be accepting donations toward Mohr’s care.